A new report from the Dutch road safety research foundation predicts that if cyclists in the Netherlands always wore a helmet, there would be 85 fewer road deaths a year. The research, which assumes that currently between none and 10% of cyclists actually wear a helmet, is based on a global meta-analysis from 2018. This found that protective headgear reduces serious head injury by 60% and slashes serious and fatal injuries by around a third. Put into a Dutch context, said the road safety organisation SWOV, this would mean up to 2,600 fewer serious traffic injuries per year. Its report suggests the most dramatic effect would be on people over 70, with up to 50 fewer deaths and 900 fewer injuries. But a spokesman for the SWOV acknowledged that the protective head wear might be a hard sell in the Netherlands. 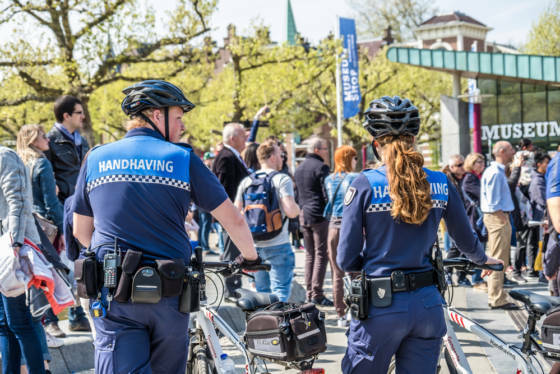 ‘Helmets aren’t often worn in the Netherlands and we are aware of the arguments [that cycling could decrease if they were obligatory],’ he said. According to the Fietsersbond cyclists’ organisation, Dutch people each cycle an average of 880km per year, and it is estimated that there are 22.8 million bikes in the country – more than the number of people. But cyclists also make up about a third of road deaths, with around 190 fatal accidents a year and an estimated 13,300 serious injuries. Some previous research has suggested that people wearing head protection act in a riskier way on the roads, but the SWOV report says that a 2019 systematic review showed ‘little evidence’ that helmets are associated with risky behaviour. It also says that criticism that obligatory helmet use would significantly reduce cycling levels is not supported by another 2018 review of 23 studies, and added that ‘if the number of cyclists drops at first, this will not necessarily be a long-term effect.’ Children in the 2016 study in Zeeland did not cycle less when they had to wear helmets. DutchNews.nl has contacted cycling association the Fietsersbond for a comment.